We were contacted by two college students who had started a small games development company, Black Rainbow Games, and were looking to develop an online presence. They wanted something simple and easy to navigate that they could update easily as they had a lot of news to share with visitors to their site. We played with a few variations of the black rainbow for the logo idea and we went for a geeky font (Ubuntu) which fit in with their company outlook. 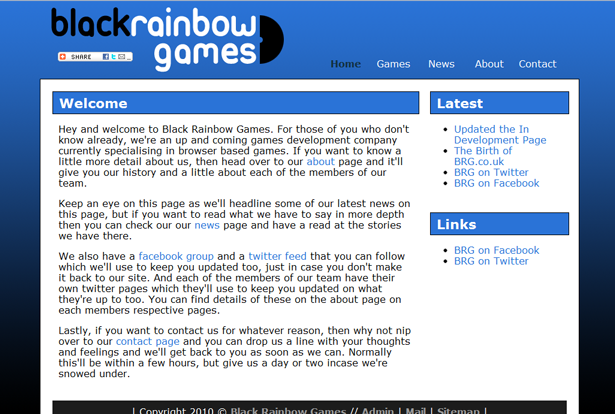 We kept the text on a simple white background to make sure the content was clear for visitors to read. "As a small business, and as students, our main concern was cost. We approached a number of companies looking for quotes, but Swift got back in touch with us within a couple of hours with a quote that worked with our budget and time scale. All we had to give them was our name and what we did and they took it from there. We received a number of emails with some ideas and once we picked what we liked and didn't, they had our website up and running within a week. We couldn't recommend them highly enough." by: Jamie Smith, Cosmoonaut Creations. Paid-for listings maintained its position as the largest single format with a 58% share of the market. £1,313.4m was spent on search in H1 2011.